Blackjack happens to be so hugely popular all over the world. Its popularity could be attributed to its simplicity and easy game play. Even the rules are quite easy to follow and could get familiar with its rules in no time. Moreover, it traditionally has the history of the player getting a favorable outcome instead of the dealer, especially if blackjack card counting is used. If you know the correct rules, math, proper usage of statistics then you could be the one taking away all the cash stash. It is game that you must realize is all about mastering over the time and it's worth it. As you might know Blackjack has 1 or more number of decks of cards and each deck has 52 cards in it. The numbers of players vary from one to six. The deck of cards could be dealt either by a hand or if there are many decks a shoe for decks can be used. To approach twenty one, you have the freedom of opting for another card. This is referred as Hit. This is normally done by means of hand signals in real casinos and in online blackjack one can hit just by a click. But mind that if you already have high hand, going over twenty one would make you lose the game. 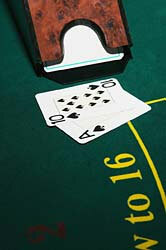 The player also has the option of not accepting any more of the cards if he feels that his hand is sufficiently high. When you choose to stand, the play goes to dealer. Double down could easily be the most complex moves in Blackjack. It happens when you double the actual bet by putting the same no. of chip with the actual bet and then asking for other card in order to complete the hand. As this move gives a lot of edge to the players the casinos put a restriction to this move having value of ten or eleven. So it is recommended to check out various rules of Double Down of each Blackjack variant you play. A player could opt to split a particular pair in to 2 separate hands if the first 2 cards he gets are of the same value. For doing so, he could put a 2nd bet equaling the actual as per the blackjack rules. It implies forfeiting half the actual wager to put an end to the game while in current hand. A lot of casinos have special rules for the move of surrender. Many allow it later in game.